Part 1 has shown how to install the software Tacacs+ on a windows 2008 server and some fastest configuration to get it working with your Windows server administrators group. In this part 2 post, more configuration will be presented to explain how some other function or feature works. 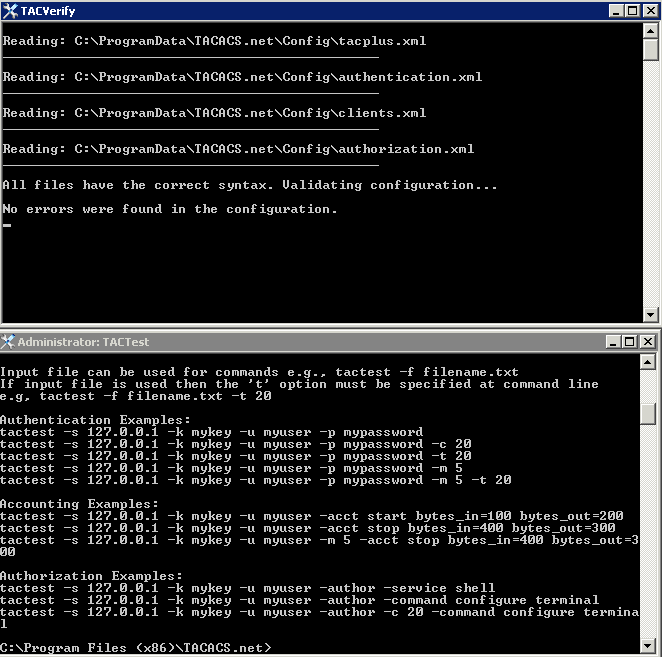 After installation, four configuration files will be generated under C:\ProgramData\TACACS.net\config folder. Please keep in mind, different OS will have different location to hold those files. Please create a backup copy in case you want to recover them. Tacacs+ Software supports different authentication methods such as Local Service (File Group) Users, Localhost Users and AD users. There are two users , user1 and user2 , pre-configured to be used. For example, the user1 's login password is somepassword, and no password for enable. 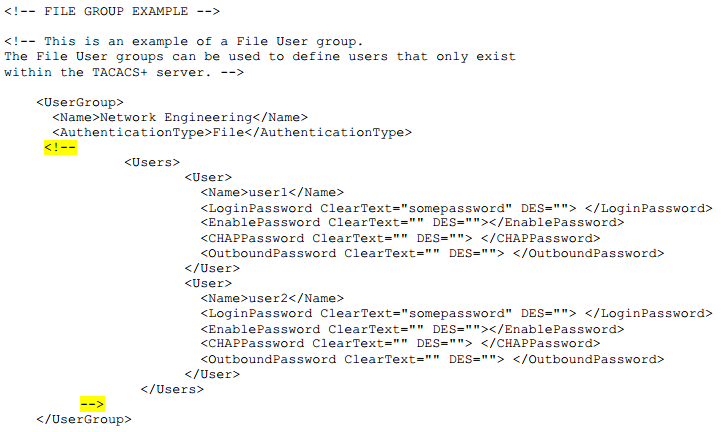 <!-- This is an example of a File User group. Localhost users is the local users and groups in the windows 2008 server itself. In the part 1, there are some steps already shows how to use Localhost users. Basically find out following configuration in the authentication.xml, Local System Administrators groups have been permitted. Only thing you will need to do is to add new users into local administrators group in windows 2008 Tacacs server as shown in part 1. There is no need to set up Enable Password, since your localhost user's password will be enable password too. <!-- This is an example of a Windows Localhost group. AD authentication and LDAP authentication has been detailed documented in the configuration guide. Please check it from there. That is because the authorization.xml did not authorize you to use enable command. By adding <Permit>enable</Permit> into following configuration, you will be able to use enable command. Keep in mind, the enable password is same as your login password when you use Local Server's administrators group or AD users. Until here, a functional Tacacs+ server will be fully up and running. You should be able to use local file users and local administrators group to log into your network device. The client (network devices) configuration for Tacacs+, you should be able to find it from Part 1. Following commands should get you basic ideas how the configuration looks like. TACVerify - USed to verify your configuration files. Each time, after you changed your configuration files, do not forget to run it to validate them. If there is anything wrong in those files, your TACACS.net service won't be able to start.